SOUTH BEND, IN -- The Rev. Theodore Hesburgh was always a man of conscience. 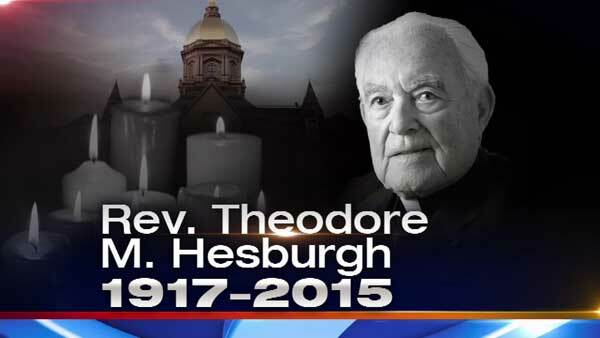 Hesburgh died late Thursday night on the university campus in South Bend, Indiana. He was 97. His cause of death wasn't immediately known. Leran more about Fr. Hesburgh's life here. DePaul University President Rev. Dennis Holtschneider called Fr. Hesburgh, "a lion... in the pride of Catholic higher education." "He not only built Notre Dame into the nation's preeminent Catholic institution of higher learning, but he became a leader and champion for all of Catholic higher education's service to this nation. His deep faith in God and in the enduring goodness of this nation continue to inspire. May the Lord grant him good rest and grant all of us a share of his spirit," Holtschneider said in a statement. "I said, 'I ended this job the way that I began 15 years ago - fired with enthusiasm," Hesburgh recalled in 2007. As a young priest, Hesburgh's students included Jose Napoleon Duarte, whose 1984 election as El Salvador's president set that country on a path to democracy after years of civil war. Hesburgh's decision to have Duarte give Notre Dame's 1985 commencement address was met by protests blaming Duarte and the Reagan administration for continued political killings and poverty in the Central American nation. Hesburgh wrote that the presentation of an honorary degree to Duarte didn't mean the university has to agree with all he was doing. ABC7 Eyewitness News contributed to this report.